On the 2-d and 3-d scatter plots you can write text labels adjacent to plotted points. To do this click the Draw Labels ( ) button in the dataset toolbar (below the plotting area in the plot window). 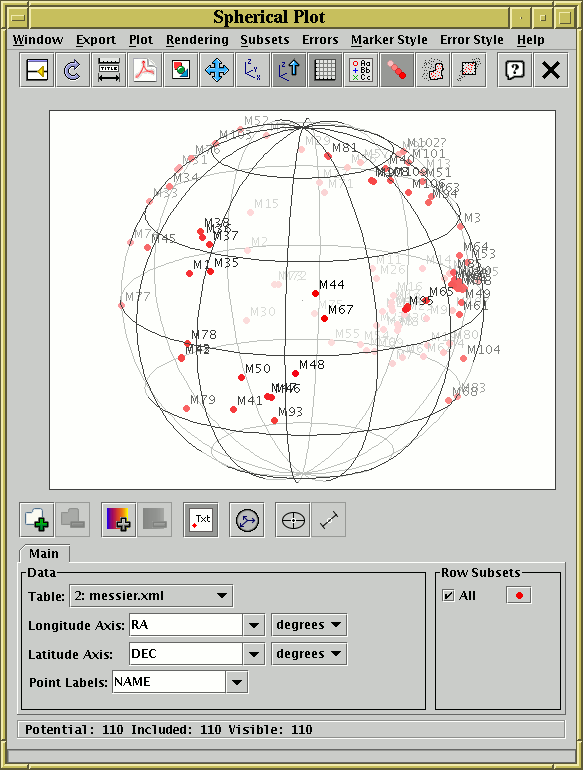 This will reveal a new Point Labels selector below the existing spatial ones. Using this you can select any of the table columns (not just the numeric ones as for the other selectors), or give a string or numeric expression involving them. When this selector is filled in, every point in the dataset which has a non-blank value for this quantity will have it written next to the point on the display. In this example the NAME column has been selected, so that each point plotted (in this case all the Messier objects) is labelled with its name. As you can see, where many labels are plotted near to each other they can get in each others' way. In some cases TOPCAT will omit plotting labels in crowded regions, in others not - but in any case if you have labels too tightly grouped they are unlikely to be legible.